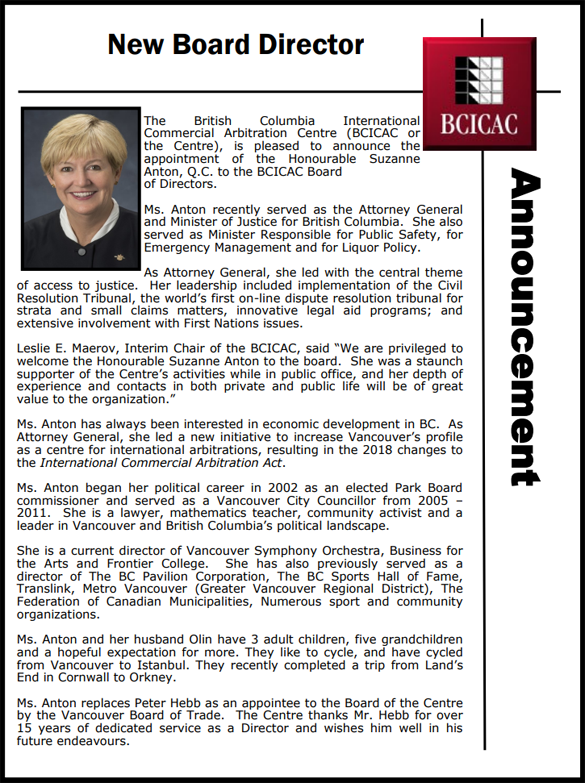 Established in 1986, the British Columbia International Commercial Arbitration Centre (BCICAC) is a non-profit organization located in Vancouver, British Columbia, Canada, committed to providing effective alternative dispute resolution services to the domestic and international business community. BCICAC is recognized as a national leader and aims to provide a one-stop alternative dispute resolution service. It offers fully administered arbitrations and mediations dispute resolution services upholding the highest standard in the domestic and international arbitration community. The Centre maintains panels of both international and domestic experts and offers disputants a choice of rules depending on the size and complexity of the matter. The Centre reflects the characteristics that have made Canada an appropriate referee in many international disputes: neutrality, objectivity and political stability. These qualities, combined with Vancouver’s geographical position, its moderate climate, striking setting and genuine hospitality, makes the Centre an ideal choice for the international business world.